Summary: The fleet of bogie hoppers used by Ready Mixed Concrete (RMC) wear a distinctive bright orange livery and until 2007 could be seen running in block formations carrying limestone from the quarry at Peak Forest near Buxton. The total of 89 wagons covers four batches built to three main designs over a period of 13 years, and trains often featured several or all of the variants. 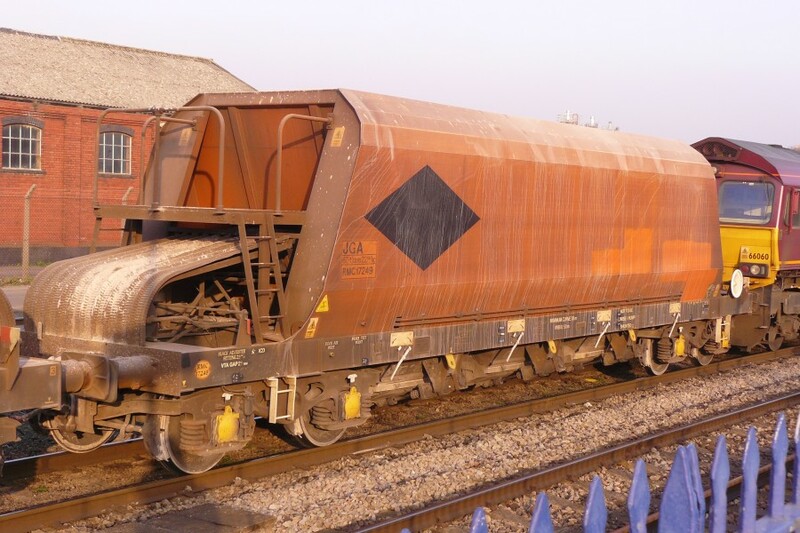 More recently the wagons have been in general use with EWS in the South East. 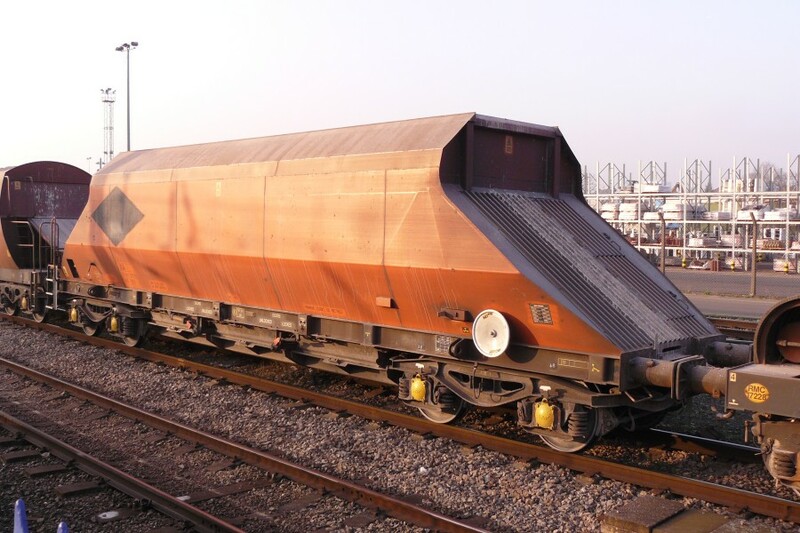 History: The first set was built in 1984 by Standard Wagon of Heywood and numbered HALL13700-13712. As the code suggests, these were initally used by Hall aggregates, a subsidiary of RMC, and transported sea-dredged gravel from Newhaven to Tolworth and Crawley south of London. The design featured gently curved bodysides with sloping ends, the ends themselves being straight-topped in line with the sides. At each end there was a short ladder leading to an inspection platform, and a sloping plate to protect the brake gear. The solebars were plain and continous, mounted on cast Y25 bogies. Livery comprised an orange body with a broad white band along the sides. At least by 1986 the lettering was for RMC (in an orange diamond) Aggregates. Solebars and bogies were black. The second batch (RMC17201-17224) was built for the RMC traffic from Peak Forest, also by Standard Wagon, in 1986. These differed slightly in that the hopper ends had curved tops, and the livery had the white band at the top of the hopper sides. Terminals served were at Slaford (Manchester), Leeds, Selby, Ely, Bletchley and Washwood Heath (Birmingham) and the trains could be seen on many routes in the midlands. 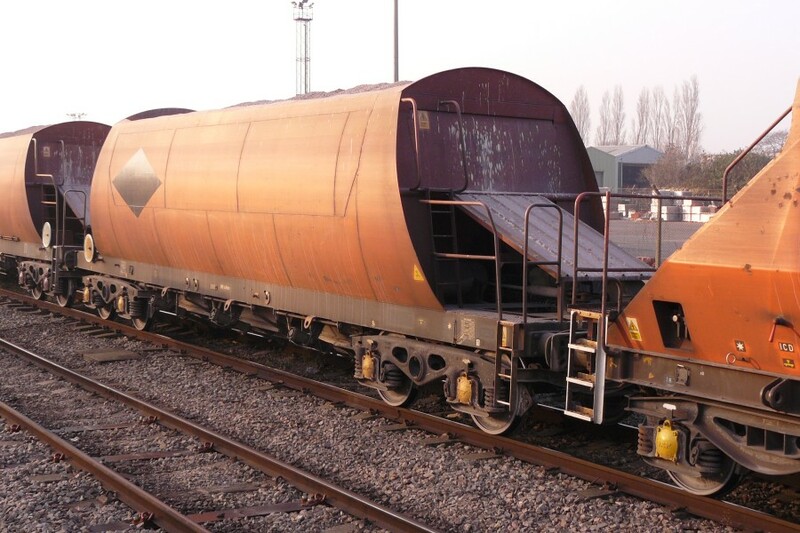 A revised design was introduced in 1990 (not 1980 as quoted in certain books) when RFS Industries of Doncaster built a batch of 25 wagons numbered RMC17225-17249. Although similar in elevation, the hoppers had straight sides, angled in at top and bottom. The end details were also revised, one end being fitted with a full-width inspection platform, beyond which the hopper inner end was visible. The other end was enclosed by a corrugated metal panel. To accomodate the platform, the protection plate (also made of corrugated metal) was at a shallower angle and curved down to meet the bufferbeam. Livery was as for the second batch with a thin white stripe at the top of the hopper sides. In 1996 the Newhaven workings ceased and the HALL-prefixed batch were transferred North to join their cousins. The prefixes were eventually changed to RMC but for a while the type could still be recognised by its different livery layout and hopper end design. At about this time the fleet was also bolstered by the hiring of several Tiphook bogie hoppers in their white and blue livery. 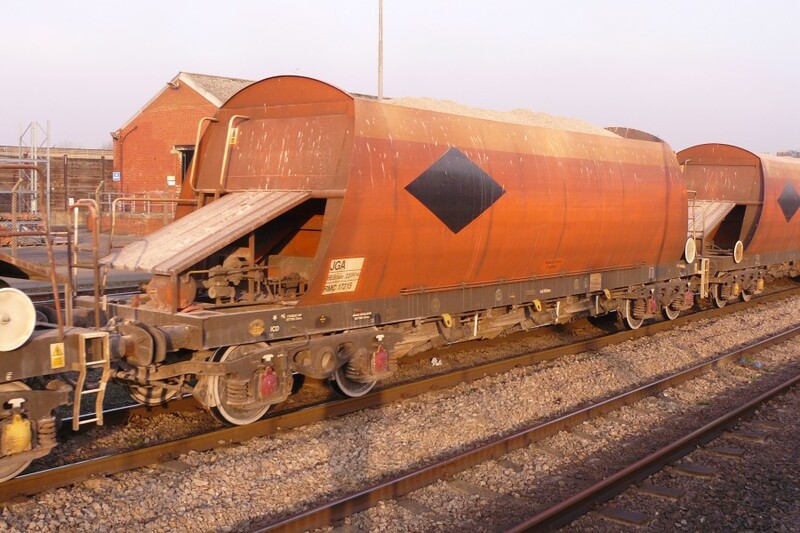 By 1999 the former Hall Aggregates wagons had been modified with curved top ends and the livery changed to match the rest of the fleet. Major changes for this type occured in 2007. EWS signed a deal with Cemex (by then the operator of the Peak Forest quarries) that saw nearly-new HOA hoppers take over the services. The JGAs were not renumbered or recoded but were transferred to other duties, in particular stone trains from the Mendips. All of the wagons had the RMC diamond logo painted out and a few were treated to a rather basic application of allover light grey. Starting in early 2015, the JGAs started gaining repaints into DB Schenker red livery. 20/12/2007: Page updated with new traffic flows and 4 photographs. Batch 1 - RMC13711 in EWS use at Acton Main Line, 20th December 2007. Batch 2 - RMC17215 at Acton Main Line, 20th December 2007. Batch 3 - RMC17249 at Acton Main Line, 20th December 2007. Batch 4 - RMC19238 at Acton Main Line, 20th December 2007.